Your Guide to places to Eat and Drink in Wooler. Below you will find highlights of some of our preferred places to eat, a full list, along with web links (where available) is provided towards the bottom of the page. If you eat at any of these places be sure to mention where you heard about them! All of our highlighted places to eat are marked on our interactive map of Wooler. Buy a full guide of where to Eat and Drink in Northumberland. Milan Restaurant High Street, Wooler, Northumberland, NE71 6BY - 01668 283692. You may not find the location of The Milan Restaurant immediately obvious when you're walking along Wooler High Street. It is tucked away down an ally just after the Black Bull pub, perhaps not where you would expect to find a top notch Italian restaurant! But in our experience top notch it certainly is, one of many genuinely great Italian restaurants in Northumberland along with Gianni's and Marabini's in Morpeth and the Coquetvale Hotel in Rothbury. The service here is always friendly and the staff will go that extra yard for you to make a celebration meal even more special. The menu is what you would expect to find from a good Italian, plenty of pasta, pizza, a good children's menu and also a varied and comprehensive specials board. If you're staying in or around Wooler I would personally make this your first priority for a meal out, just make sure that you book a table! Visit their website for more information and online menus. I would say its the best curry in Wooler without a doubt! If you like a little spice in your food I don't think you can go wrong with a Spice Village. Their curries are packed with flavour, plenty of meat (unless you have a vegetarian dish) and the staff are really friendly and helpful. It was a toss up between recommending Spice Village or The Milan Restaurant as the top place to eat in Wooler and it was a really close call. Portions are definitely on the large side which suits my healthy appetite nicely and with really good value for money I can't say a lot more except go! An attractive 17th Century Coaching Inn, the Tankerville Arms has a very good reputation in the local area. The family run hotel has an elegant restaurant aptly named 'The Cheviot' which offers lovely views over the garden. Produce used in the restaurant is all local and from within a few miles radius wherever possible in order to create 'the very best of Northumbrian fayre'. Menus are varied and the good quality ingredients definitely shine through. Visit their website for more information and menus. If it's a drink or a good bar meal you're after you'd struggle to do better in the area than The Red Lion. The staff are really friendly and offer a warm welcome, you get the impression they genuinely car for their customers. The décor is modern, and light whilst still keeping its 'country pub' styling and the food is good pub grub. Home-made chips, good quality ingredients cooked well at a reasonable price. What more could you want from a bar meal? This pub is famous for being Northumberland's only thatched pub (one of many thatched buildings in the beautiful Village of Etal) and also for it's, shall we say, somewhat quirky interior. The owners would appear to have a penchant for the macabre with many dolls of witches and strange objects dotted around the place. It all adds to the sense of fun though and other than that its your typical country pub with hearty home cooked meals. We can highly recommend the fish and chips which were particularly delicious and generous in portion. 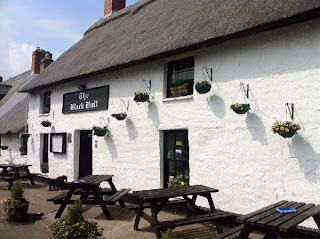 The Black Bull is particularly attractive in the summer months with its huge hanging baskets, they also have a beer garden and welcome families. This traditional tearoom set in the picture postcard Village of Etal also serves as the Village Post Office and general store, talk about multi-tasking! 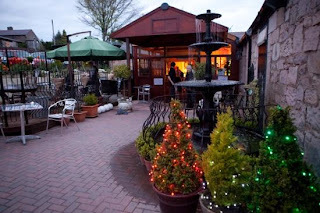 Lavender is open all year round and serves a good range of light snacks, coffee, afternoon tea and cakes. There is a garden area to the front if the weather is being kind and they also offer a range of plants, baskets and tubs on sale. Red Lion Hotel - 1 High Street, Wooler Public House Friendly Pub with excellent bar food. Spice Village - 3 Peth Head, Wooler Restaurant Curry house with fantastic flavours and reasonable prices. Cindy & Millies Takeaway Takeaway Does what it says on the tin! Foulis Fish and Chips - 1 Market Place, Wooler Takeaway One of two fish and chip shops in Wooler. Oriental Kitchens - 2 Ramseys Lane, Wooler Takeaway Chinese takeaway in the centre of Wooler. Storman Norman Chippie - 2 Market Place, Wooler Takeaway One of two fish and chip shops in Wooler.